Student ID and Drivers License Required at Sign-In. self-employed. Learn how you can efficiently track income and expenses throughout the year and correctly file your taxes. Topics will include record keeping, form 1040, Schedule C, the self-employment schedule, deductions, hobby losses, home offices, and more. 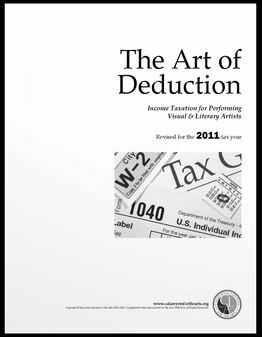 A comprehensive workbook, "The Art of Deduction," is included with the admission fee. Additional handouts will also be provided. Abe Carnow is very active in tax practice and tax education. As a nationwide lecturer for Gear Up Tax Seminars, Abe teaches other accountants about individual income taxation, business income taxation, and ethics. In his tax practice, Abe works with a variety of professionals, including graphic artists, performers, and other service professionals. From 1974-1990, Abe worked for the Internal Revenue Service, in the examination and appeals divisions. Abe has been presenting C.L.A. 's annual tax workshop for artists in Los Angeles since 1993. These workshops are made possible, in part, by the Los Angeles County Board of Supervisors through the Los Angeles County Arts Commission, the Department of Cultural Affairs, and the California Community Foundation. Additional support provided by the California Arts Council. California Lawyers for the Arts is a tax exempt 501(c)(3) nonprofit and your donation is tax deductible as a charitable contribution to the fullest extent of the law. State Bar LRS Certificate #0021. The information provided on this website is not legal advice. You should consult with an attorney for individual advice regarding your legal matters. Copyright © 2019. California Lawyers for the Arts. All Rights Reserved.